I don’t know about you, but I’ve got a drawer that’s always overflowing with my tot’s artwork. I save her creations from preschool, the fun doodles she makes on her own at home, and the exciting artworks we create together. She sometimes selects ones to display on the fridge and I stash others to show her when she’s all grown up. The other day the drawer was so full it wouldn’t close, meaning it was time to go weed through the creations. 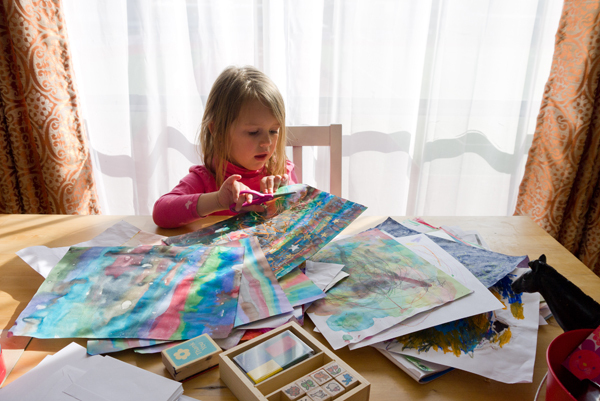 It’s hard trashing your child’s art, but before making the final cut, we used a stack for creating thank you cards to send to friends and family thanking them for all the wonderful holiday gifts. 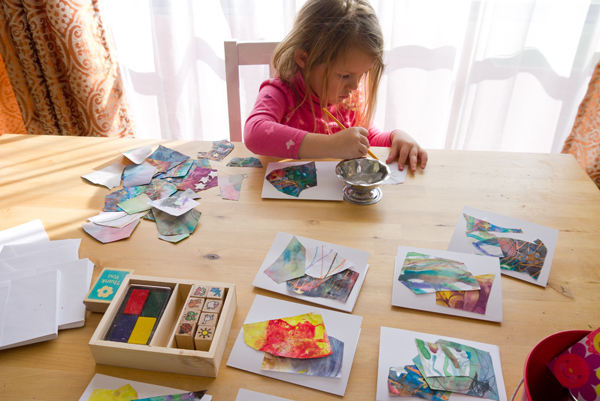 After you have a nice stack of shapes and funky forms, offer your child some glue to coat the cut paper and press onto the front of blank cards, which you can find at your local craft store. 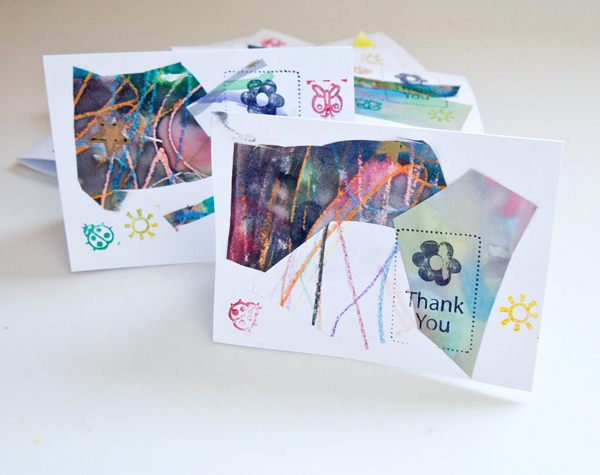 To personalize the cards, offer your child a thank you stamp to press on the front of cards. Older kids can use letter stamps to press “thank you” on the cards or even write the letters themselves. We had a few other fun graphic stamps that my tot pressed around her cards, along with in the inside as her signature. We sat together and talked about the gifts she had received, and who they had come from, while I wrote short notes from what she shared in the cards. After addressing the cards and sticking on stamps, we popped them in the mailbox and waited for our mail lady to come and whisk them away. At first my daughter was a little sad they were being taken but then we talked about how the mail works and how everyone was going to love opening her special thank you cards. Along with being a great art activity, this is a really fun way of introducing the mail system to your child. 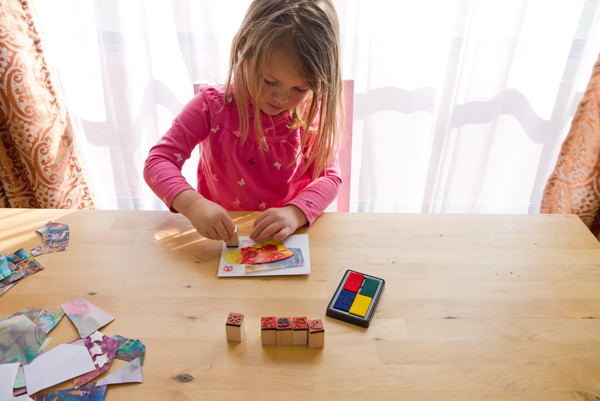 Since creating her cards, we’ve set up our own post office and she’s wonderfully busy making cards, folding them into envelopes, and addressing and stamping them herself.